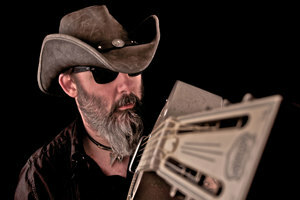 Solo singer-songwriter, Dave Arcari, has all the darkness and mystery of an old school slide guitar Delta Blues sound. But then he starts singing in a Scottish accent, and all of a sudden your expectations are completely turned around. Then when the elements of Rockabilly and Cowpunk come in, you know you’re hearing a unique take on the traditional. A seasoned and nonstop performer, Dave is a Scottish artist on his second tour through the United States. 30 dates in 6 weeks across the Eastern half and Midwest of the US, he’s got 8 dates in Wisconsin alone where you can catch him. We spoke to Dave about the tour, about what inspires his distinctive sound, and how a Scotsman got into a very American musical form. Maximum Ink: What inspired you to pick up instrument and play in the first place? Dave Arcari: My Dad played a bit and when I was a kid. I’d steal his nylon-strung Spanish guitar, cover it with tinfoil – think I was trying to make it look like the guitars I’d seen on the TV – and hammer the strings with a big old UK pre-decimalisation penny. Needless to say I’d make a terrible noise and bust all the strings in about 10 seconds! I didn’t get the urge to learn to play properly ’til I was about 18 when, as a spotty teenage bank worker, I spent my Christmas bonus pay on a Harmony Sovereign steel-string acoustic and started to try and learn some Bob Dylan songs. MI: Who were the artists that led you to the Blues? DA: When I was seven or eight I got into Johnny Cash after being at a friend’s house and his Dad playing some records. I and no idea what Johnny Cash tune/s I’d heard but as soon as I had enough pocket money saved up I went out and bought the first Johnny Cash album I saw…it was some kind of double album compilation (I still have it!) and luckily featured Cash’s Sun years stuff rather than the more ‘middle of the road’ stuff he was doing by the 70s. Could have been formative disaster! That Sun studios sound – early rock’n’roll, slapback and stuff – became a signature sound in my head, so as a kid I liked any 50s rock’n’roll and some of the 70’s British 50s-inspired glam rock/pop… I didn’t ‘discover’ blues until I was a bit older and had already been playing guitar for a year or so…I guess I was listening out for any music that really featured guitar so it was just a matter of time before I got into blues. And, of course, so much of early Dylan stuff is pretty much blues-based. Once I’d learned a few songs I’d go to a Sunday night pub session in Glasgow with some friends and get up and sing whatever new Dylan/Neil Young/etc song I’d learned that week. One Sunday those particular pals weren’t around so I went to a different pub where a band was setting up. An electric blues band. They – Big George and the Business – blew me away and, as I’m still reminded today, I turned to another pal who was there and said “that’s what I want to do…” ! That’s pretty much how I got into blues. MI: What’s your single? What’s the best intro to your sound for new listeners? DA: Mmm… that’s not easy. Maybe “Got Me Electric” or “Devil’s Left Hand”? Like most of my songs, these both came from guitar riffs/parts that I thought were ‘a wee bit different’… I’m not sure where the lyrical inspiration comes from. Usually my songs come from a guitar part and I just sing some random stuff – whatever pops into my head that fits – more often than not that random stuff becomes the theme of the song. I suppose it’s inspired buy the rhythm/feel of what i’m playing and some subconscious topic that’s swimming around somewhere in the back of my head! MI: What’s behind the name, “Whisky in my Blood”? DA: Unlike the two songs I mentioned earlier, I purposefully set out to write a song about whisky – it seems inextricably linked to my persona! Maybe because I drink quite a lot of the stuff…so much so that my veins probably have more whisky running through them than blood. Maybe a 50/50 mixture! MI: Are there any themes or ideas that permeate a lot of your music, wells that you always find yourself returning to? DA: Not really. I’m constantly trying to come up with fresh ideas on the guitar which, in turn, drive the songs. It’s not an easy task though – most of my stuff is bottleneck-driven in open C or G tunings and I don’t like to use more than three chords. My favourite songs are usually based on just one chord. No need for any fancy-assed stuff. So I’ve set myself quite a tight brief to keep it simple and recognisable…so it is hard to keep coming up with fresh ideas from that intentionally limited pallet. In saying that, I’ve started writing some songs in regular tuning and banjo too to try and open things up a bit. MI: You’re just one guy up there, what can people expect? DA: Energetic and hard-hitting – but carefree, fun and perhaps a little irreverent. Folks seem to find it quite exciting for a one-man solo show. Don’t rely on recordings or Youtube – get out and support live music. Nothing comes close to the live experience. See you there! Some of Dave’s dates where you can catch him in the Midwest are Eau Claire at Phoenix Park on August 5th, Driftwood Char Bar in Minneapolis on August 11th, at the Lyric Room in Green Bay on August 14th, Limericks in Wausau on the 15th, DAT Bar in Merrill on the 16th with The Goddamns, and August 19th at Madison’s High Noon Saloon.